12.5" RCOS @ ~f/9 (2880 mm fl) at 0.64 arcsec/pixel. Shown at 1.28 and 3.05 arcsec/pixel. SBIG STL-11000 w/ FW8 filter wheel, AstroDon 6nm Ha and 3mn OIII filters. 9/24/2015 to 11/7/2015 Chino Valley, AZ... with CCD Commander & CCDSoft, AOL guided. CCDStack to calibrate the sub exposures. PixInsight processing includes registration, stacking, RGB creation, gradient removal and non-linear stretching with HistogramTransformation. Although this image was taken with narrow band filters it is a fairly good presentation of what the nebula looks like if red, green and blue filters were used. This is possible because the band width of the OIII filter is about half way between green and blue. This technique works especially well with this nebula because the RGB colors are mostly red and cyan. These wisps of gas are all that remain visible of a Milky Way star. 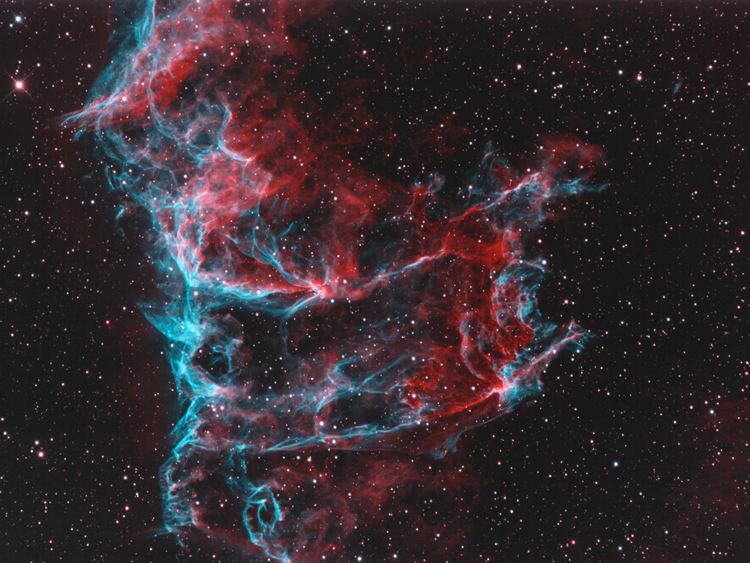 Many thousands of years ago that star exploded in a supernova leaving the Veil Nebula. At the time, the expanding cloud was likely as bright as a crescent Moon toward the constellation of Cygnus, visible for weeks to people living at the dawn of recorded history. The remaining supernova remnant lies about 1400 light-years away and covers over five times the size of the full Moon. The Veil Nebula is also known as the Cygnus Loop.